Chloe Collins was one of two Texas volleyball players to post a double-double in the Longhorns' victory over Lipscomb (photo courtesy of texassports.com). AUSTIN, Texas — Don’t think for a minute that the Texas volleyball team that beat Oregon and then lost to top-ranked Nebraska last week in the Vert Challenge in Eugene, Ore., is the squad UT coach Jerritt Elliott expected to have on the floor once this season began. 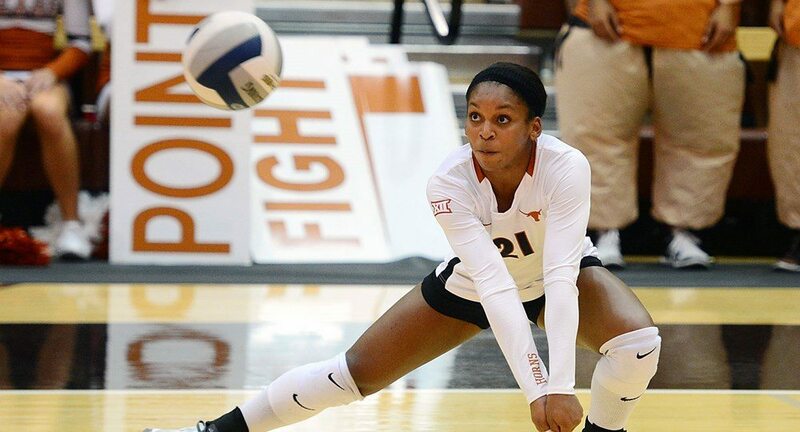 You can thank the academic ineligibility of junior middle blocker Chiaka Ogbogu for the fact that the Longhorns, the national runner-up last season and the No. 2-ranked team to begin the 2016 campaign, possess a huge hole in their attack that Nebraska was able to exploit.